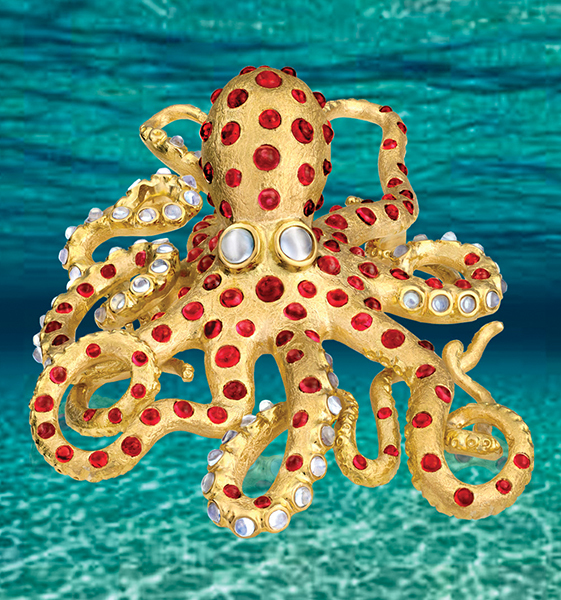 There are two names in the jewelry, gem and watch industry that need no further explanation. On the watch side, there is “Basel.” On the gem side—and increasingly for jewelry—there is “Tucson.” Located in the southern part of the Arizona, there is no place in the world like this small desert city that turns into a multitude of gem and jewelry shows during the month of February in 2016. Multi-gem, silver and gold cuff by Michou. Silver and gold necklace by Rebecca Myers. Spectrum Award winner earrings in diamonds and Paraiba tourmaline by Caroline C.
Multi-gemstone brooch by Jye Luxury Collection. Silver and gemstone cuff by LJD Designs. 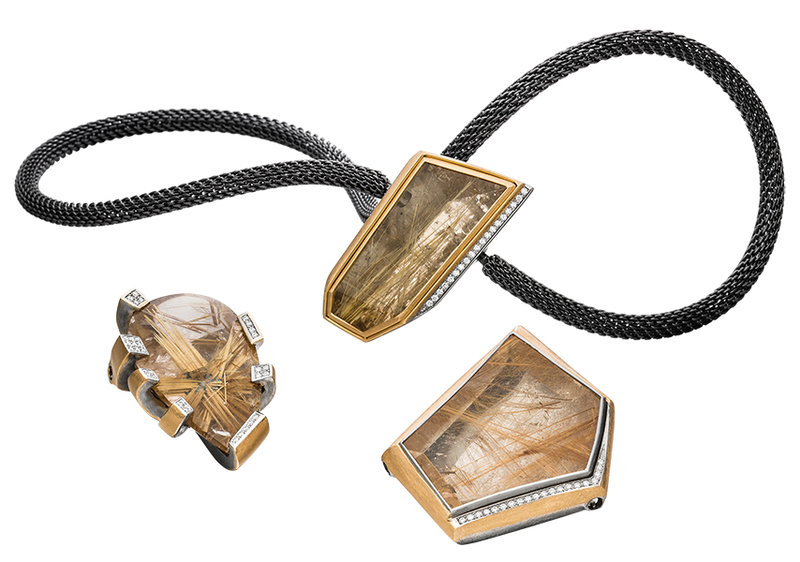 Rutilated quartz and gold jewelry by Marcel Roelofs. Faceted grape garnets by Prima Gems USA. Larimar and pearl pendant by Helen Serras-Herman. Paraiba tourmaline in matrix with sapphires and diamonds by Samuel Sylvio. Spectrum Award winner carved 63.19-ct Paraiba gemstone by John Dyer. Multi-gem brooch in gold by Crevoshay. ​ On my connecting flight to reach Tucson, it was abundantly clear that it was the period of the gem and jewelry shows. The majority of passengers were decked out in a wide variety of jewels, from artisanal beads to southwestern silver and turquoise to higher-end designer pieces. Even many of the men had interesting stone-set bolo ties or gem-set necklaces and bracelets. All around me, passengers were talking about the latest opal find, the merits of Oregon sunstone, a recent fossil find or where to find some of Nature’s most unusual gemological oddities. The attraction of this southern Arizona town is that February is really a gem lover’s paradise. “We don’t even find this variety in Hong Kong,” stated a buyer from Germany who visits the show every year. While most of the 40 shows scattered around the city in large halls, hotel rooms, and sprawling roadside camps are open to the public, a few are restricted to the trade. The main B-B shows are AGTA GemFair, located in the Tucson Convention Center in the heart of the historic old town, and GJX, held in a massive tent across the street. The small JCK Tucson show was held at a Starr Pass resort up the mountains, about 30 minutes from the AGTA and GJX shows. One of AGTA’s exhibitors, Simon Watt of Mayer & Watt, located in Maysville, Kentucky, also had a smile on his face: “Eighty percent of my business at the show this year was new business.” Noted designer and gem dealer Philip Zahm also had a good show, with interest both in his gemstones and original jewelry. Gary Lee, of Princut, who creates novel ways of recycling diamonds, said he was very happy with both the turnout at the show and with sales of his unique diamonds. Reaction at JCK Tucson was also quite mixed, with half of exhibitors expressing satisfaction while the others lamented that the show was very quiet. German designer Marcel Roelofs was among those who were happy with contacts he made during the show. “I’ve seen good, quality buyers so cannot complain,” he said. Similar comments were heard from Lord Jewelry. With shows as vast and diverse as Tucson, it is hard to say that there are dominant and specific trends. Exhibitors tend to specialize in certain gemstones and colors, which may or may not be the “flavor of the month.” Having said that, however, in addition to the vast range of product, a few standouts were noted: the neon blue of Paraiba, in both translucent and in matrix forms, a rainbow of spinels, a delicious array of grape garnets and rutilated quartz. Opal in all its forms and colors were available, notwithstanding the completely unfounded rumors that Ethiopian opal was treated with resin. A number of jewelry designers were featuring zircon, especially the blue variety, but bemoaned the fact that consumers are totally confused by the name “zircon” believing these stones to be the fake “cubic zirconia.” More than one suggested that the name of zircon be changed. A quick glance down the main corridor of the AGTA GemFair reveals the booths of all the major organizations in the gem and jewelry sector. Tucson is also the time for their annual parties, receptions, and meetings. A relative newcomer to the Tucson gem scene was GIT, the Gem & Jewelry Institute of Thailand, whose director, Dr. Pornsawat Watkunakul, introduced three sets of important ruby and sapphire grading tools called Master Sets. With the industry in need of consistency in determining the specific color of gemstones, these Master Sets are a welcome addition. “Certain colors, such as Pigeon’s Blood Red, Royal Blue and Cornflower Blue, are especially prized by consumers. 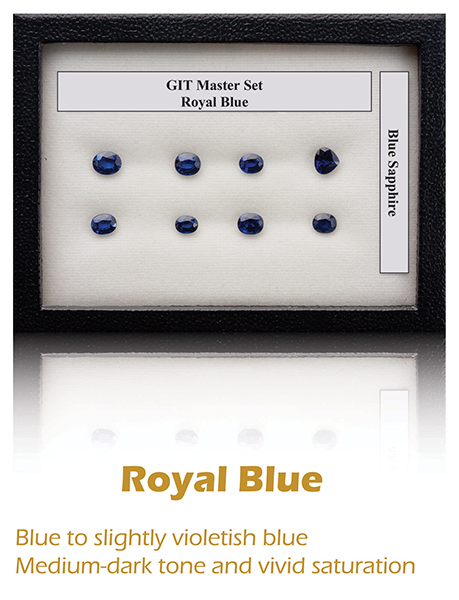 Unfortunately, one lab’s ‘Royal Blue’ may not be the same as another lab’s.” In order to increase customer confidence and standardize color nomenclature, the GIT has spent years developing these three color series in consultation with gem dealers and gemologists. It also makes these sets available to other laboratories, in the objective of bringing coherence to the industry. The next Tucson gem shows will begin January 31, 2017. 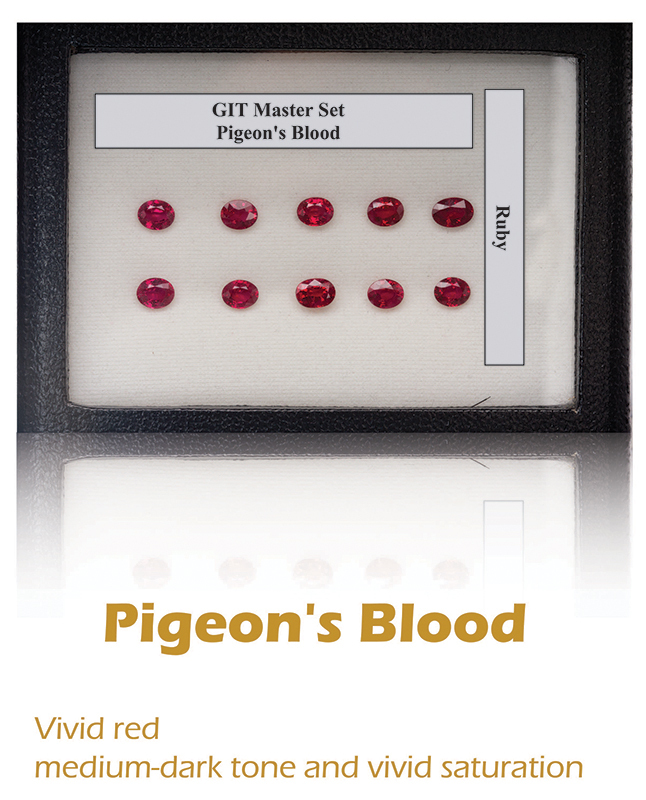 GIT's master set of standardized colors showing the range of acceptable hues that correspond to the popular color category of Pigeon’s Blood ruby. GIT's master set of standardized colors showing the range of acceptable hues that correspond to the popular color category of Royal Blue sapphire.